Editor’s Note: After an EMP or CME (Corronal Mass Ejection) the world will go dark and silent. However, if you have your faraday cage ready and packed with all essential electronics, together with a solar generator to power your PC or your phone, you’ll be one of the very few people who’ll enjoy a strong tactical (communication) advantage. You might be inclined to say that a WiFi antenna will be useless in the aftermath of an EMP, but remember that the WiFi is simply a radio, which is used for computers or smart phones. Another spec of WiFi is that its waves have a short range, however, today’s article will show you how to increase your WiFi antenna’s spectrum. So, be one step ahead of everyone when the world as we know it will be gone. Looking for an inexpensive way to increase the range of your wireless network? 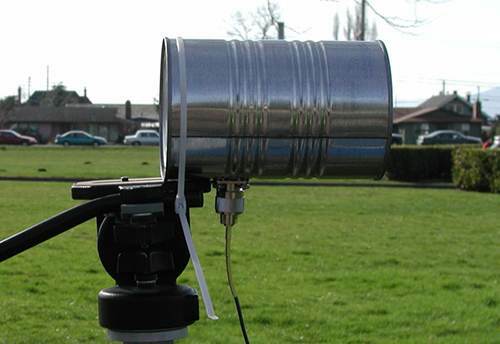 A tin can waveguide antenna, or Cantenna, may be just the ticket. This design can be built for under $5 U.S. and reuses a food, juice, or other tin can. Also, here’s the ten cent modification you can do to double your radio’s range. I am not an electrical engineer, nor do I have access to any fancy test equipment. I’ve built some antennas that worked for me and thought I would share what I learned. I have no idea if this is safe for your radio or wireless network equipment. The risk to you and your equipment is yours. Building your Cantenna is easy, just follow these steps. A N type Female Chassis-mount connector. One side is N-female for connecting the cable from your wireless equipment, and the other side has a small brass stub for soldering on wire. These can be found at electronics stores internet suppliers (see the list below under “Connect your antenna…” If you shop around, you should be able to find these for $3-$5). You’ll need them just long enough to go through the connector and the can. I’ve used #6×1/4″ stainless. 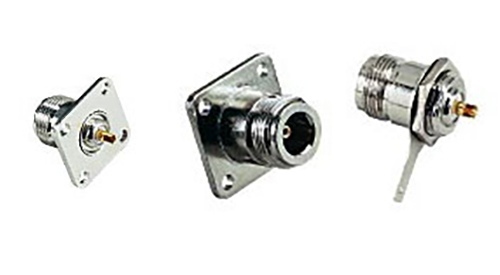 If your N-connector is a screw on type, then you won’t need the nuts and bolts. You’ll need about 1.25″ of 12 guage copper wire. This wire will stick into the brass stub in the N-connector. A Can This is the fun part. You’re looking for a can between about 3″ and 3 2/3″ in diameter. The size doesn’t have to be exact. 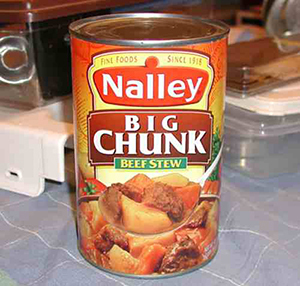 I made a good antenna with a Nalley’s “Big Chunk” Beef Stew can that was 3.87″ in diameter. Others have reported good results with big 39oz. 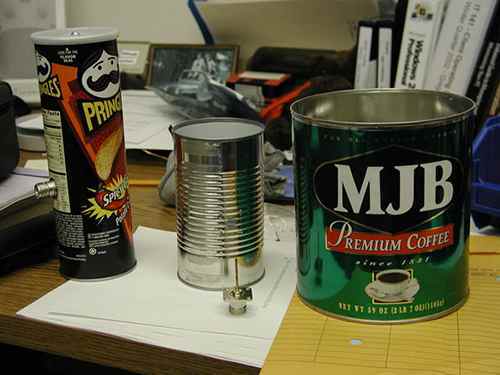 coffee cans that are 6″ in diameter. The Pringles can is really too small for good performance, however. Try to get as long a can as possible. The old fashioned fruit juice cans should work well. The N-connector assembly will mount in the side of your can. You need to put holes in the right place to mount the connector. The placement of the hole and connect is very important. 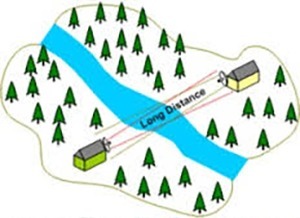 It’s location is derived from formulas that use the frequency that the antenna will operate at and the can diameter. To make life easy on you, here’s a calculator to figure it out for you. 802.11b and 802.11g WiFi networking equipment operates at a range of frequencies from 2.412 GHz to 2.462 GHz. Ideally, with your can size, the TE11 cut-off frequency should be lower than 2.412 and the TM01 cut-off should be higher than 2.462. It would be good, also, if your can is longer than the 3/4 Guide Wavelength. If your can is a little off in length or diameter, don’t despair, experimentation is fun! You want to mark the location on the can where you will put the hole for the connector. The 1/4 Guide Wavelength number tells you how far up from the bottom metal end of the can to put the center of the hole. Open only one end of your can, eat the contents, and give it a good washing. You’ll probably want to remove the label too. 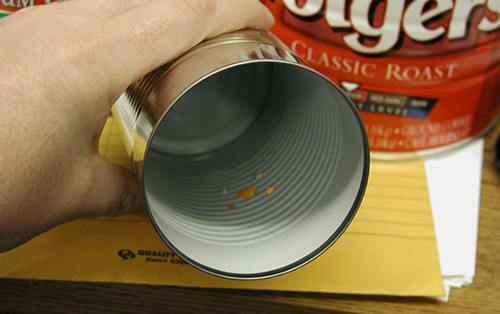 Use a ruler to measure up from the closed end 1/4 Guide Wavelength and mark the can with a dot. If you’ve got a drill, select a bit that matches the size of the center of your connector. You may want to start with a small bit and work the hole larger and larger. You could even start with a hammer and nail, then use drill bits. If you don’t have a drill, start with a nail hole and use a file to get the hole to the required size. If you’re using a bolt on connector, make four more holes for the bolts – you can use the connector as a drilling guide. Now you’ll need that bit of wire. You’ll need a soldering iron or a friend with one as well. Cut the wire so that when it is stuck in the connector as shown, the total length of both the brass tube and wire sticking out past the connector is 1.21″. Get as close to this length as you can. When you’ve got your wire correctly sized, solder it into the connector keeping it as straight and upright as you can. When it’s cooled, bolt or screw the assembly into your can. 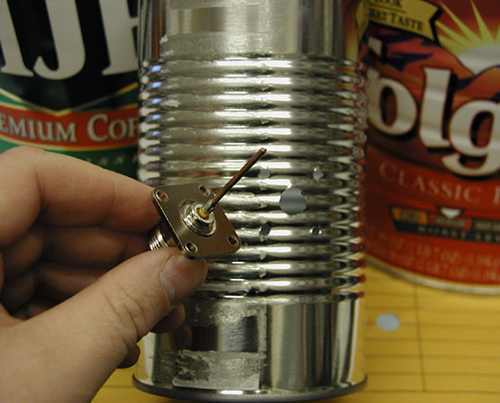 Put the heads of the bolts inside the can and the nuts on the outside to minimize the obstructions in your antenna. Your Done! To use your cantenna, you’ll need a special cable commonly called a “Pig Tail”. The pig tail connects your wireless card or access point to you antenna. One end of the cable will have a “N” Male connector (just right for connecting your your cantenna), while the other end will have a connector appropriate to your card or access point. Fleeman Anderson & Bird has a “cantenna kit” for sale that includes the connector and pigtail. Choose one of the “cables” links from the menu and look towards the bottom of the list. Hook up your cable, point the antenna at a friend’s, and see how far you can stretch you network. This antenna has linear polarization. That means that how you rotate the antenna will affect the strength of your signal. Usually, you will want to put the connection straight down, but experiment with rotating the can while watching the signal strength on your PC to get the best performance. This article was gladly contributed by Greg Rehm and it was first published on www.turnpoint.net. Does any one have a way of boosting a signal for a cell phone ? I live in an area where cell phone reception is very bad. I do get reception, but only in ONE spot in my front lawn. It is even better in bad weather, which I do not understand. 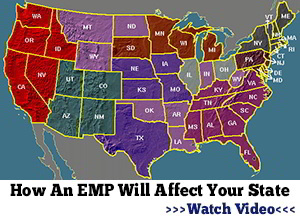 You WON’T HAVE A CELL PHONE if there is an EMP, so don’t worry about it. Even if you put yours in a Farraday cage, no one else will, and the towers won’t work without power. Get either CB radios, or HAM radios, or even the FRS radios, and put them in a “safe” place. Cell phones won’t work. Really? If I put my electronics in a Faraday cage no one else will? TOO FUNNY!!! Amazon sells cell-phone receivers that then boosts your signal inside your house or where you set it up at. Be sure to set your privacy access, or your neighbors will not believe how they now get better reception. Costs 300-$400 for one that will really work. If you have ATT, they sell a cell tower via your home internet connection. Also, set your securities. Beware the first EMP. Soviet (‘scuse me, I mean Russian) and ChiCom strategic doctrine dictates that after the first EMP, a second and perhaps third one should be delivered at an indeterminate time, perhaps a couple of weeks or a month after the first. This allows time for all the clueless preppers to get their ham radios and laptops out of their EMP bags and set them up – just in time for a second blast. Don’t doubt me on this. ITCS. It is, not, the Russians you have to worry about. It is all the do gooders, (Catholic Charity’s, Lutherans, and mormons, who received money from obama Adm.8 k per muslim) who allow muslims to come into America. It is IRAN, IRAQ, ETC. that will be the problem. RUSSIAN IS NOT THE PROBLEM. Russia is now Christian. We are not in a cold war, but the LEFT/ LIBERALS are trying very hard to “start something” with Russia. Older Prepper… It is not all the religious outfits that are doing as you say!…NOT all are bought and paid for; most of us earn on our own or by our parishes the money to do what we do, with very little! So do NOT lump all of us in one pile. God works in all ways and there are good and bad in all groups..remember that. God Bless you and open your eyes and remove the hardening in your heart to faith in God which is the only salvation there is to humanity.. Most cell home companies sell antennas​ that you lug into your home and wifi that will extend your signal to 4g for up to 300 feet. AT&To calls them Microcell. Use a stainless steel trash can, line it with cardboard or old rubber floor mats. Wrap whatever you are going to put in it with plastic wrap. The “key” is to not allow anything you put in there to touch the sides of the can. One way to check a faraday cage is to place a FM radio inside while its playing music or whatever and when you put the lid on, you shouldnt be able to hear it, just static noise. You said “stainless steel”. Would a regular galvanized trash can work? Maybe, you would have to test it first using the AM/FM radio test, just place the radio inside and if you only hear static then it should work. Be sure to insulate the bottom of the can too and make sure the lid is on tight. Yes, to answer your question. I believe Dr. Bradley used galvanized trash cans in his experiments on building an effective faraday cage. If you are holding on to the object when someone touches a hot wire to it and you get a shock, it will work as a faraday cage. If you are grasping the container in your hot sweaty and someone touches a hot wire to it and you feel nothing, it will not work or you are already dead and don’t need to worry about it. Sorry, couldn’t resist the feeble attempt at humor. The metal needs to redirect the flow of electrons (hey, I don’t have a PhD in electrical engineering so bear with me) from penetrating the device you are trying to protect. The metal container directs the electrons into the ground. The items inside, being insulated from the metal of the container remain shielded. The reason for needing a tight fit around any opening is so that electrons don’t leak inside the container. HOWEVER I have also read that one can construct a faraday cage out of perforated steel, so that whole business of a tight fitting lid is contradicted by a faraday care of perforated steel. I wish there was some really definitive, scientifically conducted, peer-reviewed with approval, testing done by some organization that didn’t have an axe to grind that was reported in plain old every day English that we could all understand that would shed some real light on the topic with some solid, well developed advice. Even Dr. Bradley’s experiments were somewhat over my limited knowledge of electricity, which is: don’t touch the black and the white wires together while the juice is flowing. I touch the black and the white wires to each other to make sure that I swithed the proper circuit breaker off when I am working on the wiring in the house. I have only had it spark on me 3 times in the last 15 years. I watched a documentary on NetFlix years ago where a few guys did the AM/FM test using a 40 gal. galvanized garbage can with lid. It worked very well for those items so i would suppose it would work for all other electronics.. I can’t think of any reason it wouldn’t. Steel is steel, galvanized and stainless. My Faraday Cages are galvanized and the handles are put on by a spot weld. I use metalized glue to put on a ridge of copper brillo length of gasket. It works real well. Without this type of gasket radio signals got through the 30 gallon trash can. For extra protection I sealed it with copper tape. According to Dr. Arthur Bradley in his book, it isn’t necessary to seal out every last stray electron. It is sufficient to seal out enough electrical flow so that flow falls below the level that will damage whatever is stored inside. That is the rub. How much is enough to damage the equipment you have stored inside the cage. He found that just plain old duct tape actually reduced the electron flow more than the specialized, more expensive tape designed for protecting against electron leakage. He has written what I consider to be the most common sense book on doomsday preparation that I have read so far and I probably have close to 50 books on the subject of survival, some of which are ludicrous. I don’t need to know how to survive a plane crash on some remote peak in the Andes, nor how to survive being stranded in the Amazon basin. What I really need to know is how to survive when TSHTF right here in River City. Another option, if you and your group still have cellphones that work, but no working towers/network, is made by goTenna. It comes with two attachables that will go on two different cell phones that will make them able to communicate. Sells on Amazon for $149 per two-phone set, but everyone with one can communicate. I saw a faraday cage one time that was made out of simple chicken wire fence and grounded every couple of feet and at every grounding point there was a cooper wire about 10 guage braided between the chicken wire to the oppisite side of the cage This cage was about 10×12. Where the equipment was at was was all rubber matting. All power was inside and it had a quick connect to the antenna on the roof. I am building a 8×8 on the same principle. The important thing with a faraday cage is that the metal exterior surface is continuous. Small openings are okay, but I prefer to go with solid metal. To be extra sure, put your radio in it’s box, without the antenna and battery. Wrap the box a couple of layers of al. foil, wrap that with a plastic covering, for insulation. Special Forces motto, ” Two is one, one is none.” In other words, always have a backup plan and equipment. Simply get a large microwave oven. Put your items inside it. Keep all batteries charged monthly or your equipment won’t work anyway. Cut the cord off the microwave. Label it FARADAY CAGE. What about using those tins that popcorn or cookies are put in(Houston Harvest popcorn tins)? The lid seals good. They measure 11 inches tall, about 9 inches across. Portable. It is called a Faraday CAGE for a reason! Nicolas Tesla used them to protect himself from the discharge of his Tesla coils. The most important thing is that they be made from a conductive material like metal mesh that completely encircles and envelopes the items inside, and is well grounded. The purpose is to intercept the electromagnetic energy of the pulse through induction -induce a current in the wires or material that make up the cage and ground that current to the earth where it will not harm the items inside. Just like an antenna does with the electromagnetic energy of radio waves. Millimeter length waves have a very hard time penetrating the Earth’s atmosphere, They become “adsorbed” and /or scattered. These kinds of very short waves are not very energetic, and do not penetrate well. Light consists of electromagnetic energy of specific frequencies or wavelengths which our eyes are designed to “see”. The visible spectrum is that part of the electromagnetic spectrum that penetrates our atmosphere best with the greatest resolution. Longer wavelengths of light are in the red part of the visible spectrum, and the shorter wavelengths are in the blue. At dusk, that is why the sun appears more red or “dusky”. The longer red wavelengths penetrate the greater angular “depth” of the atmosphere much better than the shorter blue wavelengths. The same principle applies here. Design your Faraday cage to protect against the most likely high energy wavelengths. As to what Wheatley Fisher posted, he is correct in that your microwave at home is built with a Faraday cage to ground out the energy of the microwave emitter. Those microwaves are harmful ionizing radiation, and we need to protect ourselves from it. But DO NOT cut the cord completely off, just the end. Then strip the wires back and solder/braze/weld those wires onto a conductive copper or copper coated iron rod approximately 6 to 8 feet long that you have driven all the way into the earth! In most places, this will provide your ground or “earth”. In desert areas, you may need multiple “ground rods”. Best would be deep enough to reach into moist sub-soils. Paint cans are cheap and work for smaller items. Cut out some rubber matting for the inside walls. I use them for batteries. For bigger items, I concur with most other methods above. I have used several… popcorn tins., but cardboard boxes to line inside & use lid as a diagram to cut inner SIDE “OF” lid. MANS’ BEST FRIEND….DUCT TAPE helps . NO METAL exposed inside. Can’t afford double items so BATTERIES, SMALL MULTI BAND RADIO FLASH LIGHT OLD LAP TOP(9 YEARS OLD)IN A 30 gallon Trash can, I converted. WOULD be nice to have 4 2-way “CB” type RADIOS, BATTERY CHARGERS. I have a solar generator.. BUT NOTHING big enough “to” STORE IT IN. While you are at it, be sure to ground the faraday cage to an earth ground to insure conductivity of the EMP to earth and around your electronics. Also consider using self tapping sheet metal screws around the circumference of the lid to the can to beef up the contact between them. Concerning the WiFi antenna, I have built several for short-haul WiFi communications links using a Maxwell House 13.5 oz. coffee can. You can find instructions on Instructables.com and search for Maxwell House Wifi Antenna. With several of these antennas and WiFi access points operating on different channels, it would be possible to set up a reliable long-haul WiFi microwave link for point to point line-of-sight communications. Good Luck and happy shielding.